“Michael Haneke is back to many of his old tricks in Happy End, which enfolds the child psychopathy of Benny’s Video, the bourgeois nightmare of Hidden, the euthanasia theme of Amour, and the racial discomfort of Code Unknown into a curious, disconcerting and sometimes insidiously effective greatest hits tableau,” announces the Telegraph’s Tim Robey. “Ultimately, this will count as an interlocutory title in the director’s impressive filmography,” predicts Screen’s Lee Marshall. 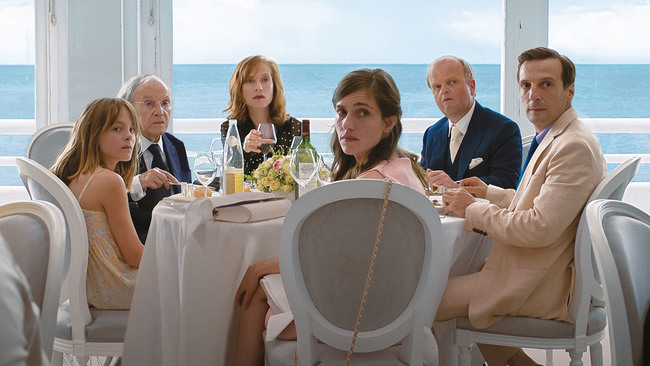 “Happy End's various dangling plot threads may be immediately puzzling, but they ultimately form an involving, deceptively empathetic portrait of personal grief as it's experienced in a desensitized first-world society,” writes Simon Abrams at the House Next Door. Happy End is one of the films discussed in the latest Film Comment Podcast (59’45”). Update, 5/30: “Haneke doesn’t even pitch movies to Huppert anymore; he just asks her to show up.” Jada Yuan talks with them for Vulture. And it makes for a pretty fun read, too.